Have you ever tried a meal swap? this idea is for YOU!! What is that, you ask? Well, I’ll tell you…. It is where you take turns cooking with a friend (or in my case, 2 friends)! I did this a couple years ago…and I REALLY miss it! I was hesitant at first, but grew to LOVE it! This is how we did it. We lived in an apartment complex and found two other families with similar family sizes (two adults and two kids) who lived in the same complex. One of us cooked for all three families on Tuesday, someone else took Wednesday, and the other person took Thursday. We usually did a main course, a veggie, and a side dish. We all agreed on a time and we delievered the meal to the other two homes as close to that time as we could. #1. That I only had to come up with 5 menus a week instead of 7. #2. I had more time to be with my kids and not worry about having dinner ready. #3. We got to try a lot more variety in our meals. #4. When I already knew what I was fixing, it was easy to triple it and it didn’t take a lot of time. Here is one of our favorite meals that we received one night. First thing you do is dip your chicken in egg and then flour. Fry in butter until deep brown. Next, you will place the chicken in a 9 X 13 pan. I mix the sauce in a easy pour measuring cup and pour over chicken. You might want to double the sauce if you are like our family and like extra sauce! I usually do. Then you bake at 350* for 30 minutes. I usually cook it for 15 minutes, turn the chicken over, and then cook it the remaining 15 minutes. So go ahead…call a friend and try a meal swap. You might REALLY like it! I love the surprise in the middle! This is the first time we’ve ever tried putting stuff in the middle. Love it. You have to try this one! Enjoy! 1. Preheat oven to 350 degrees F. Line 24 cupcake tins with liners. To prepare the cupcakes, place the cake mix, pudding mix, eggs, oil, milk and sour cream into stand mixer. Beat until well combined, about 2 minutes. 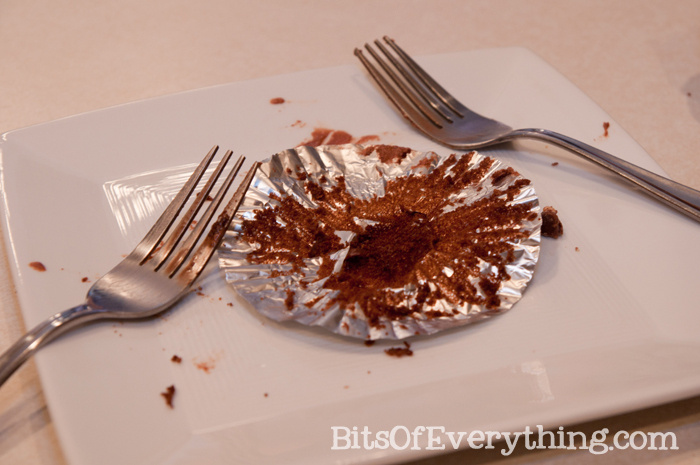 Scoop the batter evenly into the cupcake liners. Bake for 20-25 minutes or until cupcakes are cooked through and a toothpick comes clean from center. Remove the cupcakes from the tin and let cool. 2. To prepare the mousse, melt the milk chocolate chips in the microwave, stirring every 30 seconds. Set aside to cool. Meanwhile, whip the heavy cream with a stand or electric mixer until it looks like whipped cream and stiff peaks form. Fold melted chocolate chips into whipped cream until well combined, then transfer batches into a piping bag. 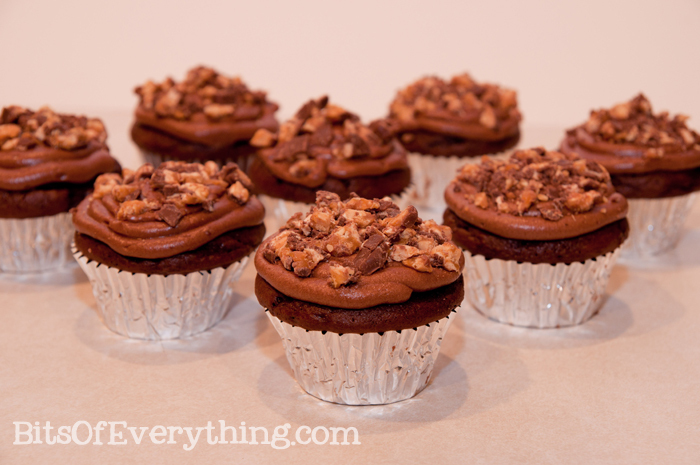 When cupcakes have cooled, press the tip of the piping bag into the center of the cupcake, about 1 inch deep. 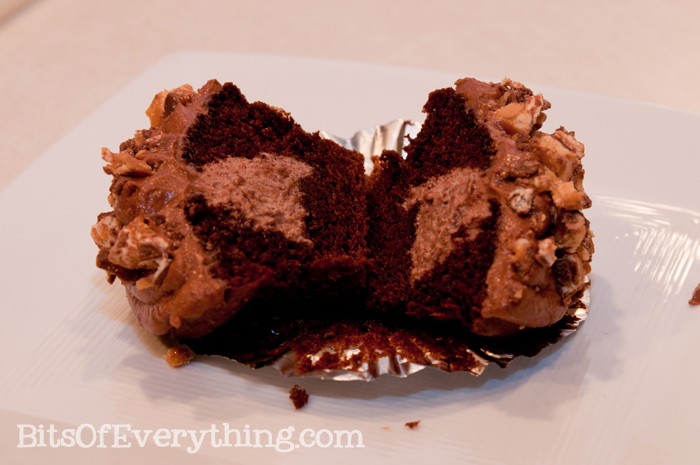 Squeeze the mousse into the cupcake while pulling the tip out. It doesn’t take much, just one firm squeeze is perfect. Continue filling all the cupcakes. 3. To prepare the frosting, beat the butter, powdered sugar, cocoa and vanilla until well combined and a nice frosting consistency. 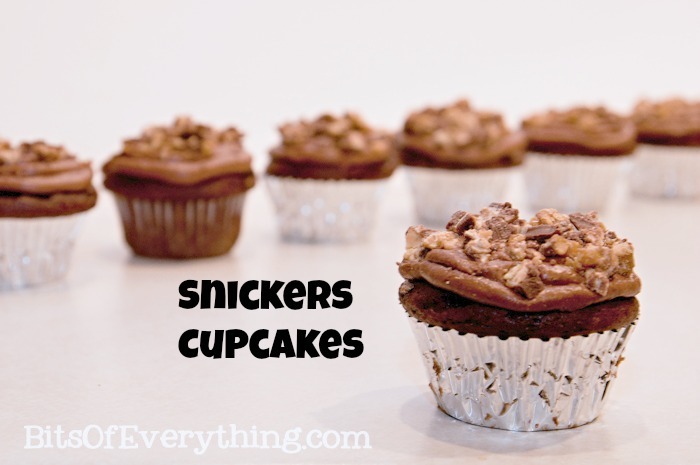 Spread over cupcakes then top with chopped Snickers. PS – If you could please vote for our money jars HERE, we would appreciate it! Thanks! 2. Meanwhile, whisk broth and flour in a small bowl. Heat oil in a large skillet over medium heat. Add garlic and cook, stirring, until just beginning to brown, 1 to 2 minutes. Add the broth mixture to the pan, bring to a boil and cook, stirring occasionally, until the sauce is thick enough to coat the back of a spoon, about 3 minutes. Remove from the heat and stir in cheese, tarragon (or dill or chives) and salt. 3. 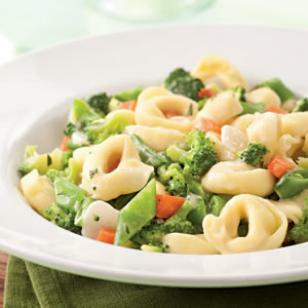 Add vegetables and tortellini to the boiling water; return the water to a simmer and cook until the vegetables and tortellini are tender, 3 to 5 minutes. Drain; add to the pan with the sauce and stir to coat. I did make a few adjustments…. * I didn’t have tarragon, dill, or chives so I used basil and italian seasoning. It turned out great. *I also had some leftover chicken I threw in, and that was a great addition. *The one thing I didn’t love was the amount of garlic. I would put in less next time, if not just use minced garlic (the spice). My house smelled like garlic for quite awhile after I made this.